Good morning. Tis gray and damp outside this morning. It's 53F degrees at the moment, but will get up to around 71F degrees in a few hours. Woo Hoo! I love it! Even when it rains, the warm temps feel nice. Well, I must say that I had a nice sleep last night. I only got up once in the middle of the night for a trip to the bathroom, then back to sleep again. Was it because the sandman did a great job? Or was it the "My Pillow" that I had ordered? My pillow came yesterday, and last night was my first time trying it out. If it gives me a good sleep most every night, then it is a wise investment. I'll have to go on-line to register "My Pillow" so that the ten year guarantee will begin. To learn more about the "My Pillow" have a look at their web site. 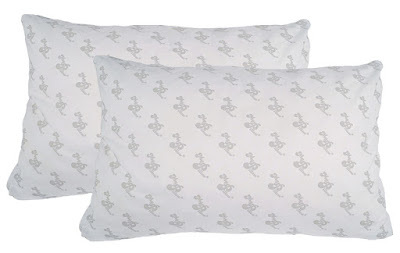 mypillow.com. 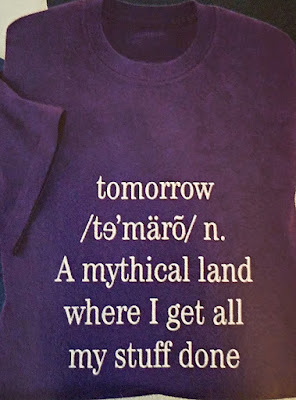 You know how I love looking at the tee shirt sayings in the many catalogues that I get, and I've found one that really does fit me to a T. When I run out of time or steam, I always say "I'll do it tomorrow." Sometimes I do, sometimes I don't. This tee shirt is perfect for me! Yesterday I had a couple errands to do, but I just could not make myself go out. Some days are like that. I did have a package that needed to get mailed though, so one of the dwarfs (Mike) took it to the Post Office for me. Thank you Mike. I really appreciate the help. Saturday, my baby Laura Jean turns fifty two years old. At six months, she only had hours to live. So you can see what awesome care can do! She can only hear and feel, but she is included in all the activities at the facility where she lives. She loves music, so I got her a few new music CD's. She also has hyperthermia so I got several pairs of fuzzy socks that will go all the way up to her knees. These will feel nice on her skin, and keep her feet and legs warm. Pogo and I didn't do very much yesterday, but that's okay. He snuggled on my lap for a long time and we took a short nap together. The mailman woke us up when he knocked on the gate to the porch. He knows how I love getting packages, and he had one for me. Woo Hoo! What was in the package? My new calendars!! Super! Now I can start the "wrap and package" process. Once again, Vista Print has come through for me. I am very pleased with all their work. Last night, DIL Janet was here, and we chatted, crocheted and watched TV after supper. It was a really nice way to finish off my day. I am so lucky to have such a super daughter in law. I am blessed in so many ways. 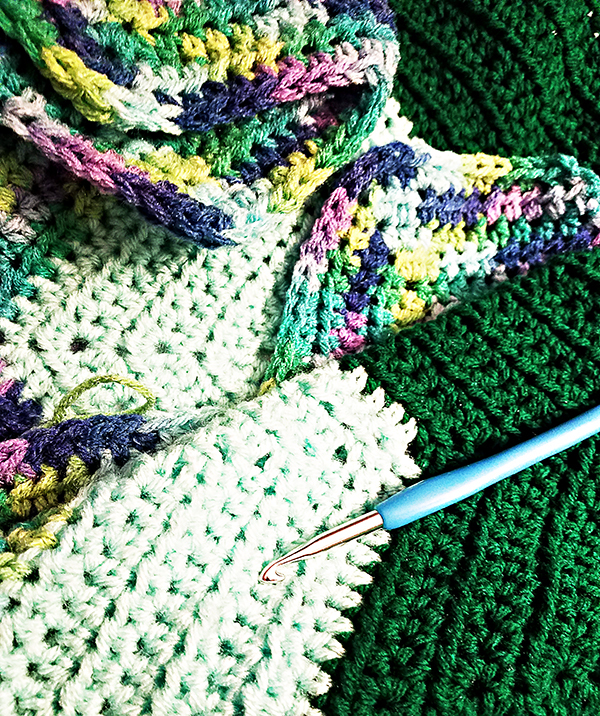 Here's how the new green afghan is coming along. These colors look really beautiful together. Now it's time to make a fresh cup of coffee and do a bit of blog reading. After that, maybe Pogo and I will go out for a while. So, till tomorrow, Y'all have a fantabulous day.